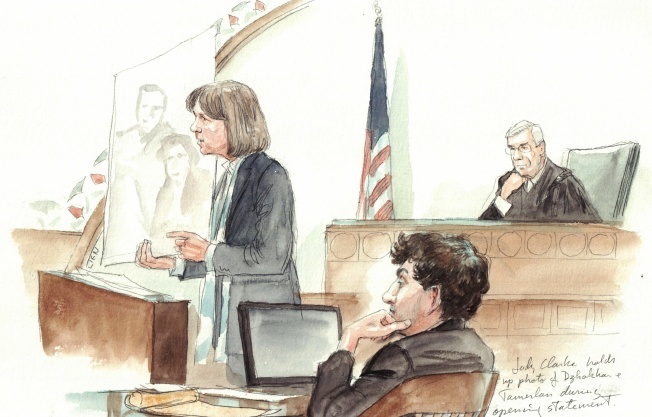 Marathon Bombing Trial: What Happens Next? Lawyer Judy Clarke shows jurors photos of Dzhokhar and Tamerlan during opening statement. Now that the prosecution and defense have rested in the first phase of Boston Marathon bomber Dzhokhar Tsarnaev's trial, there are a few steps left before jurors begin deliberating. After the jury reaches a verdict, the same jury will hear evidence in a second phase of the trial to determine whether Tsarnaev, 21, should be executed or spend the rest of his life in prison. Federal prosecutors and Tsarnaev's lawyers will give their closing arguments Monday. These arguments are the lawyers' chance to leave a final impression on jurors before they begin deliberating. Both sides use closing arguments to summarize evidence they've presented during the trial and to try to convince the jury of guilt or innocence. In this case, Tsarnaev's lawyers are expected to use closing arguments to expand on a narrative the defense began during opening statements: He participated in the bombings but only after he fell under the influence of his radicalized older brother, Tamerlan Tsarnaev, who died following a shootout with police days after the bombings. Prosecutors are likely to focus on their contention that the brothers were partners in the plan to bomb innocent people to get back at the U.S. for wars in Muslim countries. After closings, Judge George O'Toole Jr. will give the jury instructions on the law and the elements they must find in order to convict Tsarnaev. The jury must reach a verdict on 30 federal charges, including use of a weapon of mass destruction resulting in death, bombing of a place of public use resulting in death and the killing of a Massachusetts Institute of Technology police officer several days after the bombings. The jury will then begin deliberating. If Tsarnaev is convicted, which is widely expected given that his lawyers admitted he participated in the bombings, the same jury will hear additional evidence in the second phase of the trial to determine Tsarnaev's punishment. The jury has two choices: life in prison or the death penalty. The names of witnesses expected to testify during the penalty phase have not been released publicly, but prosecutors are expected to call additional bombing survivors and family members of those killed. During the first phase of the trial, Tsarnaev's lawyers complained that the survivors were being allowed to go into too much detail about how the bombings affected their lives. The defense said that kind of testimony should be reserved for the penalty phase, but the judge disagreed. It's not clear who the defense will call as witnesses. Tsarnaev's family wasn't seen in court during the first phase of the trial. During the penalty phase, prosecutors will present evidence of aggravating factors to argue that Tsarnaev deserves to be executed for his crimes. In their notice of intent to seek the death penalty, prosecutors cited a number of aggravating factors outlined in the federal death penalty law, including their allegation that he committed the offense in an especially heinous, cruel and depraved manner; committed the crime after substantial planning and premeditation; and that he is responsible for the death of 8-year-old Martin Richard, a victim who was particularly vulnerable because of his youth. Other aggravating factors cited by prosecutors include their claim that he has shown a lack of remorse and that he targeted the Boston Marathon because it draws large crowds, making it particularly susceptible to an act of terrorism. Tsarnaev's lawyers will present evidence of mitigating factors to argue that Tsarnaev's life should be spared. During her opening statement, Judy Clarke portrayed Tsarnaev, then 19, as a young man who was floundering in college and vulnerable to the influence of a brother he adored. The defense can present any factors in Tsarnaev's background or character that could militate against imposing the death penalty, including details on his family and his childhood. Some mitigating factors listed in the federal death penalty act include the defendant being under "unusual and substantial duress;" the defendant's participation in the offense being relatively minor; and the defendant committing the offense under "severe mental or emotional disturbance." The jury must weigh aggravating and mitigating factors in deciding punishment. It cannot sentence a defendant to death unless the vote is unanimous. Even though Tsarnaev faces federal charges in the killing of MIT police Officer Sean Collier and in a violent confrontation with police in Watertown days after the bombings, he also faces state charges for those crimes. Middlesex District Attorney Marian Ryan has said she intends to go forward with criminal charges against Tsarnaev in Collier's killing after his federal trial is completed.